Fueled by EA SPORTS IGNITE, FIFA 14, FIFA 14 - Legacy Edition in Europe, will feel alive with players who think, move, and behave like world-class footballers, and dynamic stadiums that come to life. Players have four times the decision making ability and feel alive with human-like reactions, anticipation, and instincts. 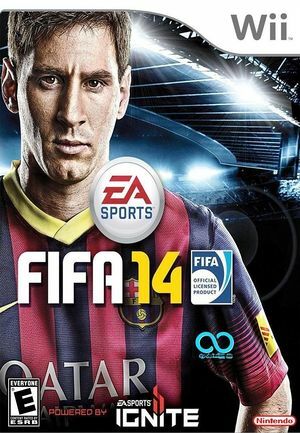 With 10 times more animation depth and detail than previous consoles, FIFA 14 delivers the dynamic movements and bio-mechanics of the worlds best footballers. Players are agile and athletic as they plant, pivot and cut, and explode out of each step. The increased fidelity has a game-changing effect on gameplay. Plus, the artistry and athleticism of footballers will come to life with the addition of hundreds of new types of skills and hundreds of new behaviors. And for the first time ever, fans will feel the electricity of a living stadium as the emotions of new 3D crowds rise and fall around the stories on the pitch. The graph below charts the compatibility with FIFA 14 since Dolphin's 2.0 release, listing revisions only where a compatibility change occurred. This page was last edited on 31 January 2018, at 09:37.